Come on out for a social evening with everyone from our puppy and pet community. Wear your leather, rubber, fuzzy, or whatever other gear you want. Of course gear is admired but never required. Having fun is the only requirement. DJ starts around 10pm for those that want to dance. Spread the word and lets all have a fun time. *Important: This month we’ll be meeting on the dance floor as Rubbout has the back area by the pool table for their Shine Party starting at 9pm. If you have a Rubbout weekend pass, come join us early then hit the party in the back after! 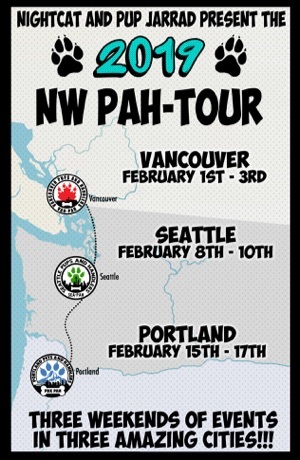 Join the pups and Handlers of VAN-PAH for the annual Rubbout mosh and puppy bowl! It’s that time again to romp and play with the folks at Rubbout! Mosh will start at 2pm. Puppy bowl will start at 3pm. VAN-PAH members can get in for free with their VAN-PAH tag or a valid VAN-PAH discount card. Attendees will have access to the mosh plus the vendor mall until 6pm. This month join us at the Vancouver Aquatic Center for a couple of hours of splashing around in the pool! VAN-PAH is excited to continue with our community camping trip! We will be heading up to Shadow Falls Campground (www.shadowfalls.ca) again on the last weekend in May. Shadow Falls is a gay owned clothing optional campground about 1.5hrs east of Vancouver heading towards Harrison Hot Springs. They have about 40 acres of private property with many amenities such as hot showers, flush toilets, club house with pool table and social area, large social fire pit, small store for firewood/snacks and power even at the tent sites. Come enjoy the grotto and the waterfalls. Take a dip in the brisk lower falls pool. Take a hike up the mountain to overlook the valley. Or hang out around your camp and share stories with friends. Reservations start on April 1. Please reserve by the end of April 30 so that we can get fairly accurate numbers for the weekend. You can reserve by following the below link. If you have a group that all want to share the same site, the campground recommends that one person puts in a reservation for the group and the staff will do their best to keep everyone together. Now with a new home at Mary’s on Davie! Wag your way and join us for food, awesome prizes, and amazing drag queen entertainment. The queens will amuse us with lots of sass during bingo and songs between rounds, enough to get us howling. Gear up if you like and let’s support our local communities. When: Wednesday, March 13. Recommended to get there before 7pm!